Abstract | Okra (Abelmoschus esculentus L.) is an important tropical vegetable of many African and Asian countries including Pakistan. Infestation of okra crop by lepidopterous borers, Earias vittella and Helicoverpa armigera (Noctuidae: Lepidoptera), has been one of the contemporary issues of the farmers in Afro-Asian regions. This two-year field study was carried out to evaluate an IPM (bio-intensive) module developed by selecting through in-situ evaluation and incorporating the most effective pest control options along with the biological (parasitoid Trichogramma chilonis egg cards) and cultural techniques against okra lepidopterous borers. According to results, maximum shoot and fruit infestations (i.e. 19.86 and 15.63%, respectively) by okra borers were recorded in control (unsprayed) module, while minimum (i.e. 6.76 and 2.89%, respectively) were found in IPM module. Mean shoot and fruit infestations in farmers’ routine module were 13.91 and 10.83%, respectively during 2016. Similarly, in 2017, mean shoot and fruit infestations in IPM module, farmers’ routine module and control module were 7.62, 14.19 and 19.52%, and 4.58, 11.07 and 18.16%, respectively. Likewise, 1.33 and 2.75 fold higher yields of marketable okra fruits were recorded for IPM module respectively than farmer’s routine module and control module. Based on the overall study findings, we recommend IPM module to the indigenous okra growers to combat infestations of E. vittella and H. armigera and other lepidopterous borers. Citation | Javed, M., M.Z. Majeed, M. Luqman and M. Afzal. 2019. Development and field evaluation of a biorational ipm module against okra shoot and fruit borers, Earias vittella and Helicoverpa armigera (Lepidoptera: Noctuidae). 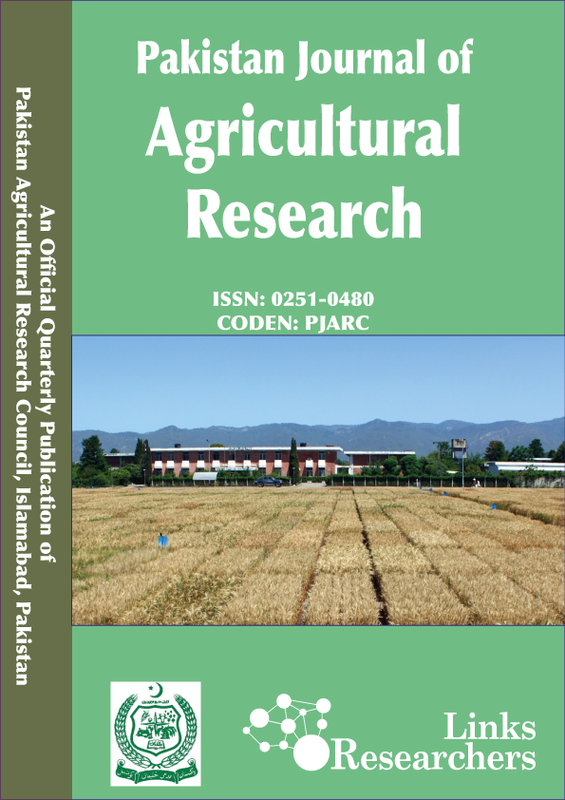 Pakistan Journal of Agricultural Research, 32(1): 170-176. Okra (Abelmoschus esculentus) belongs to family Malvaceae and is one of the major summer vegetables being cultivated in many Afro-Asian countries including Pakistan (Iqbal et al., 2014). Okra fruits have a great nutritional and medicinal importance and have been an essential part of human diet (Gemede et al., 2015). Okra crop is originated from the tropical Africa and is widely grown throughout tropical and subtropical countries (Sinnadurai, 1992; Aladele et al., 2008). In Pakistan, this vegetable crop is cultivated on a wide area with an increasing trend. Owing to its high yield output and income over the investment, farmers usually prefer okra crop over other summer vegetables (Aziz et al., 2011). In Indo-Pak regions, okra crop is infested by a number of insect pests and diseases from sowing to harvest rendering its production and quality lower than other okra producing countries (Kanwar and Ameta, 2007; Munthali and Tshegofatso, 2014). Under the agro-climatic conditions of Punjab (Pakistan), okra crop is hampered by different insect and mite pests including shoot and fruit lepidopterous borers, whiteflies, jassids, mites, flea beetles, bugs and leaf-rollers (Aziz et al., 2012; Nawaz et al., 2019). Particularly, okra shoot and fruit borers (Earias vittella Fabricius and Helicoverpa armigera Hübner, Noctuidae: Lepidoptera) are the most damaging pests which cause considerable loss to okra yield (Aziz et al., 2012; Kassi et al., 2018). Caterpillars of these lepidopterous borers chew into terminal shoots and stems causing dead-hearts and infest young okra fruits rendering them inedible and unfit for human consumption (Wajid and Ansari, 2009). These borers cause considerable damage to okra crop and can cause 30 to 80% yield loss and 10 to 60% okra fruit infestations (Kanwar and Ameta, 2007; Wajid and Ansari, 2009; Aziz et al., 2011). Indigenous okra growers exclusively rely on different conventional synthetic insecticides for the control of okra shoot and fruit borers (Iqbal et al., 2014). Most of these insecticides are hazardous and highly persistent causing several problems of environmental contamination and health hazards (Edwards, 2013). Moreover, field populations of E. vittella and H. armigera have been demonstrated to get resistance to most of the recurrent conventional insecticides (Ahmad and Arif, 2009; Qayyum et al., 2015). Apart from the conventional synthetic insecticides, there are many other biorational pest control strategies which are less toxic and more environment-friendly such as resistant or tolerant plant material, novel-chemistry synthetic pesticides, botanical and microbial pesticides and insect predators and parasitoids (Rosell et al., 2008). Although some studies have demonstrated in-situ effectiveness of different control strategies for the management of okra shoot and fruit borers, particularly in Indo-Pak regions. However, most of these studies were partial and isolated without any integration of different control tactics together. Therefore, keeping in view the ecological consequences of extensive use of persistent synthetic conventional insecticides in fruit and vegetable production and the importance of biorational pest management strategies, this filed study was aimed to develop and evaluate a bio-intensive IPM module by wisely integrating different cultural, botanical, biological and chemical control methods against the infestations of okra shoot and fruit borers (E. vittella and H. armigera). The findings of study would be helpful to the indigenous okra growing community for combating lepidopterous borers in okra and other vegetable crops. The study was performed in two consecutive crop seasons i.e. in April 2016 and April 2017 under the agro-climatic conditions of Sargodha region. The experiments were conducted at two different localities (32°07’49’’N; 72°41’43’E and 32°07’59’’N; 72°41’25’’E) situated in the research area of the College of Agriculture, University of Sargodha (Punjab, Pakistan). •	Seed treatment with imidacloprid @5g kg-1 of seed. •	Manual hoeing at 30, 50 and 70 DAS (days after sowing). •	Three foliar applications of chlorpyrifos with 10 days interval. •	Two foliar applications of deltamethrin with 10 days interval. •	Seed treatment with 5% neem (A. indica) seed extract. •	Manual hoeing at 30, 50 and 70 DAS. •	Two weekly foliar application of neem (A. indica) seed extract. •	One subsequent foliar applications of 5% bitter apple extract. •	Two foliar applications of emamectin benzoate with 10 days interval. •	One subsequent foliar application of indoxacarb. •	Five releases of T. chilonis cards with 10 days interval from 40 DAS. M-III: Unsprayed or control module: Experimental layout: Row-to-row and plant-to-plant distances were maintained as 75 and 15 cm, respectively. Insecticides and botanicals were applied upon attainment of ETL of E. vittella and H. armigera (i.e. 5% infestation) using knapsack sprayer fitted with a hollow-cone nozzle. Experimental layout was according to Randomized Complete Block Design (RCBD) along with three replications for each treatment or module. Other agronomic practices i.e. irrigation, fertilization and herbicide (Dual-Gold 960 EC; S-metolachlor) applications were carried out in all experimental plots as per routine recommendations for okra crop. Data regarding fruit and shoot infestation and yield were recorded for all treatments as described previously (Javed et al., 2018). Comparative evaluation of these three modules (as described below) was carried out for two consecutive years. Statistical interpretation of the data was done using Statistix 8.1 V (Tallahassee, FL, USA). One-way ANOVA was used to find out the effect of treatments (pest control modules) on okra shoot and fruit infestation and crop yield. Treatment means were compared by using Least Significant Difference (LSD) test at 0.05 level of significance. The preset study was conducted to perform a comparative evaluation of different pest management modules for the control of okra shoot and fruit borers (E. vittella and H. armigera). Mean percent infestation of okra shoots and fruits by lepidopterous borers was statistically different from each other (paired t-test; t = 2.69; df = 62; p = 0.01) and, hence was analyzed separately for both year trials. Analysis of variance (Table 1) clearly showed that three modules were significantly different from each other regarding percent shoot (F2, 58 = 238.67, p < 0.001) and fruit damage (F2, 58 = 136.70, p < 0.001) by E. vittella and H. armigera during 2016. Maximum mean shoot and fruit infestations (i.e. 19.86 and 15.63%, respectively) by okra borers were recorded in control (unsprayed) module (M-III), while minimum (i.e. 6.76 and 2.89%, respectively) were found in IPM module (M-II) (Table 2). Mean percent shoot and fruit infestations in farmers’ routine module (M-I) were 13.91 and 10.83%, respectively during 2016. According to picking-wise comparison (Table 3), maximum shoot and fruit infestations were recorded at 4th picking which were 18.33, 11.67 and 24.33% and 16.30, 5.51 and 18.35% respectively for farmers’ routine module (MI), IPM module (M-II) and control module. Minimum borers’ infestations were recorded at 2nd and 7th pickings for all the three modules (Table 3). Table 1: Analysis of variance of the okra shoot infestation (%) caused by lepidopterous borers (Earias vittella and Helicoverpa armigera) in different pest control modules during 2016. Table 2: Overall comparison of means of the okra shoot infestation (%) caused by lepidopterous borers (Earias vittella and Helicoverpa armigera) in different pest control modules during 2016. Means in a column sharing similar letters are not significantly different (LSD Test at α = 0.05). Table 3: Comparison of means of the okra shoot infestation (%) caused by lepidopterous borers (Earias vittella and Helicoverpa armigera) in different pest control modules for each picking during 2016. Table 4: Analysis of variance of the okra shoot infestation (%) caused by lepidopterous borers (Earias vittella and Helicoverpa armigera) in different pest control modules during 2017. Table 5: Overall comparison of means of the okra shoot infestation (%) caused by lepidopterous borers (Earias vittella and Helicoverpa armigera) in different pest control modules during 2017. Table 6: Comparison of means of the okra shoot infestation (%) caused by lepidopterous borers (Earias vittella and Helicoverpa armigera) in different pest control modules for each picking during 2017. Table 7: Analysis of variance of the mean okra fruit yield under different pest control modules. while minimum shoot and fruit infestations were observed at 1st and 7th pickings for all three modules (Table 6). Results revealed a significant impact of different pest control modules evaluated against okra shoot and fruit bores on the okra marketable fruit yield for both years (F2, 58 = 73.32, p = 0.001 for 2016 and F2, 58 = 86.63, p = 0.001 for 2017) (Table 7). Maximum okra fruit yield (10,435 kg ha-1) was recorded in the IPM module (M-II), whereas minimum okra fruit yield was recorded as 3,602 kg ha-1 in control module (M-III) during 2016. Farmers’ routine module (M-I) gave 7,327 kg ha-1 okra fruit yield during 2016 under the agro climatic conditions of Sargodha (Punjab, Pakistan) (Table 8). A similar trend of fruit yield was recorded for 2017 trial. Maximum and minimum mean yields of marketable okra fruits were exhibited for IPM (10,793 kg ha-1) and control (4,095 kg ha-1) modules, respectively (Table 8). Table 8: Comparison of means of the average okra fruit yield (kg ha-1) under different pest control modules. Bio-intensive pest management has been gained key importance for the fruit and vegetable production in the modern era. However, in the field conditions biorational pest control strategies could be effective only when these are combined along with synthetic insecticidal options (Aziz et al., 2012; Rajashekhar et al., 2016). This two year field study was conducted to evaluate an IPM module against shoot and fruit borers of okra (E. vittella and H. armigera) developed by selecting most effective pest control tactics screened out from preliminary in-situ evaluation. These screening trials showed that okra genotype Sabzpari was comparatively the most resistant or tolerant among tested available okra germplasm and, hence was chosen as the first important component of IPM strategies. Similarly, novel chemistry insecticides emamectin benzoate and indoxacarb, and botanical extracts of neem (A. indica) and bitter apple (C. colocynthis) were selected as most effective insecticidal treatments. An IPM module was developed by incorporating these best treatments with biological (Trichogramma egg cards) and cultural (manual hoeing) control techniques against shoot and fruit borers of okra and this pest management module was compared with farmers’ adopted routine pest control module and a control module. Results of the study demonstrated that IPM module exhibited minimum shoot and fruit infestation by lepidopterous borers simultaneously with maximum marketable okra fruit yield. These findings are in agreement with the results of Ajanta et al. (2010) who revealed that IPM module consisting of thiamethoxam and spinosad and neem extract exhibited maximum okra yield and minimum E. vittella infestations. Similarly, Birah et al. (2012) showed that bio-intensive module, including imidacloprid, spinosad, maize as barrier crop, clipping of dead-hearts and foliar sprays of NSKE and Pongamia pinnata essential oil, was the most effective module against okra shoot and fruit borers. Similar results have been described by Singh et al. (2012) who concluded that judicious use of insecticides (imidacloprid, indoxacarb, thiamethoxam) and acaricide (hexythiazox) and biological control agent (T. chilonis) used in module (M-I) along with seed treatment (with imidacloprid) had kept the pest population below economic threshold level. Another similar study was conducted by Kumawat et al. (2014) on the bioefficacy of 9 different pest management modules against okra shoot and fruit borers and demonstrated that module M3 (Beauveria bassiana + NSKE + Spinosad + T. chilonis) and M8 (Metarhizium anisopliae + NSKE + Spinosad + Bacillus thuringiensis Kurstaki) were the most effective against these okra borers as compared to the other modules. Conclusively, this study revealed in-situ effectiveness of IPM module against okra lepidopterous borers as compared to the conventional approach solely based on persistent synthetic insecticides. IPM module exhibited maximum okra fruit yield and minimum pest infestations. Therefore, based on these findings, IPM module is recommended to the indigenous okra growers to combat infestations of E. vittella and H. armigera and other lepidopterous borers. Authors are thankful to Dr. Sajjad Ali for his valuable assistance in improving the experimental designs. Moreover, authors are grateful to Mr. Muhammad Sufyan for helping in data collection and to the Farm Manager of the College of Agriculture, University of Sargodha for his kind support in the conduction of experiments in both years. MZM and MJ conceived and designed the experimental protocols. MJ performed experiments. MJ and ML performed statistical analyses. MZM and MJ prepared the manuscript. MA provided technical assistance in experimentation. Ajanta, B., K. Krishna, B. Someshwar, P.K. Singh and R.C. Srivastava. 2010. Evaluation of pest management modules against Earias vittella (Fabricius) in Okra. Ann. Plant Protect. Sci. 18(1): 53-55. Aladele, S.E., O.J. Ariyo and R. de Lapena. 2008. Genetic relationships among West African okra (Abelmoschus caillei) and Asian genotypes (Abelmoschus esculentus) using RAPD. Afr. J. Biotechnol. 7(10): 1426-1431. Aziz, M.A., M.U. Hasan, A. Ali and J. Iqbal. 2012. Comparative efficacy of different strategies for management of spotted bollworms, Earias spp. on okra, Abelmoschus esculentus (L). Moench. Pak. J. Zool. 44(5): 1203-1208. Aziz, M.A., M. Hasan and A. Ali. 2011. Impact of abiotic factors on incidence of fruit and shoot damage of spotted bollworms Earias spp. on okra (Abelmoschus esculentus L.). Pak. J. Zool. 43: 863-868. Birah, A., R.C. Srivastava, K. Kumar, P.K. Singh and S. Bhagat. 2012. Efficacy of pest management practices against pest complex of okra (Abelmoschus esculentus) in Andaman. India. J. Agric. Sci. 82(5): 470-472. Edwards, C.A. 2013. Environmental pollution by pesticides. Springer science and business media. New York, USA. pp. 542. eISBN: 978-1-4615-8942-6. Iqbal, J., N.I. Jajja, M. Jamil and M.W. Hassan. 2014. Field evaluation for efficacy of conventional insecticides and insect growth regulators against spotted bollworms, Earias spp. of cotton. Pak. Entomol. 36(2): 97-104. Kanwar, N. and O.P. Ameta. 2007. Assessment of loss caused by insect pests of okra, Abelmoschus esculentus (L.) Moench. Pestol. 31(5): 45-47. Kassi, A.K., H. Javed and T. Mukhtar. 2018. Screening of okra cultivars for resistance against Helicoverpa armigera. Pak. J. Zool. 50(1): 91-95. Kumawat, S.C., B.L. Jatt, B.M. Meena and M.K. Yadav. 2014. Bio-efficacy and economics of IPM modules against pest complex of okra, Abelmoschus esculentus (L.) Moench. Ann. Agric. Biol. Res. 19(3): 499-504. Munthali D.C. and A.B. Tshegofatso. 2014. Major insect pests attacking okra; Abelmoscus esculentos (L) Moench, in Sebele. Botswana J. Agric. Appl. Sci. 9: 90-96. Nawaz, A., M. Razaq, Z.M. Sarwar, M. Sajjad, S.A. Ubaid, M.A. Zulfiqar and U. Haider. 2019. Determination of economic threshold level (ETL) of jassid, Amrasca bigutulla bigutulla (Cicadellidae: Homoptera). Pak. J. Agric. Res. 32(1): 28-32. Rajashekhar, M., K.R. Reddy and C.R. Goud. 2016. Study on validation of different IPM modules against bhendi shoot and fruit borer, Earias vittella. Int. J. Agric. Sci. Res. 6(3): 259-265. Singh, S.S., M.K. Rai, S.K. Dwivedi and P. Kumar. 2012. Validation of ipm modules against major pests of okra in Dehradun (Uttarakhand). India. J. Entomol. 74(4): 375-378. Sinnadurai, S. 1992. Vegetable cultivation. Asempa publishers, Accra, Ghana. pp. 208. Wajid, H. and M.S. Ansari. 2009. Life table of spotted bollworm, Earias vittella on okra. Ann. Plant Protect. Sci. 17(1): 86-89.